This article illustrates a situation where you need to set up your own mail server (be it your home mail server, or a small office one). It actually shows that, if using an integrated service mail server, anyone can do the job, all in a matter of minutes. 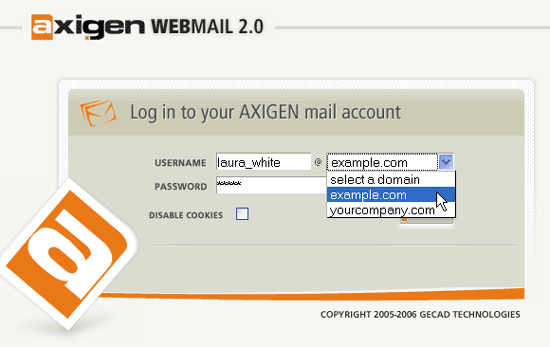 AXIGEN Mail Server, the solution chosen for this example, can send and receive e-mails securely via "mydomain.com" and is able to retrieve them in a WebMail interface - this means that it includes all mail services needed for a fully functional mail server (SMTP, IMAP, POP3, WebMail, WebAdmin). AXIGEN Mail Server can virtually integrate with any Antivirus/Antispam application and it comes with built-in connectors ClamAV Antivirus and SpamAssassin. The second part of this article shows you how to install these applications and configure these connectors for use with AXIGEN. Thus, at the end of this process which can take up half an hour at most, you will not only have your mail server up and running, but also virus and spam protection for your incoming and outgoing mail traffic. AXIGEN runs on several Linux distributions (Gentoo, Redhat/Fedora Core, Slackware, Debian, Ubuntu, Mandrake/Mandriva, SUSE), on BSD versions (FreeBSD, OpenBSD and NetBSD) and on Solaris but for the purpose of this article, let's suppose you are setting up your mail system on a Fedora Core 6 platform. In five easy steps, you will have your server installed, your primary domain running and access to the Web configuration interface (WebAdmin). This will create the entire directory structure needed for AXIGEN to run. After the installation, no daemons or related application will be started. 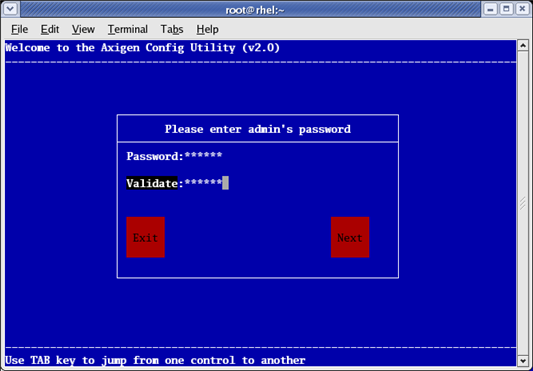 AXIGEN provides several configuration options (configuration file, Command Line Interface), but the most intuitive and comprehensive one is WebAdmin, the Web configuration interface. The corresponding WebAdmin service is enabled by default, as well as the other default services: IMAP, Logging, POP3, Processing and SMTP. The first configuration steps take place using the configuration wizard. You will set the administrator's password, select which services are started and what interfaces will be used. In this stage of the setup you also create the primary domain that your server will use. NOTE: You have to make sure you do not start the mail server before the initial configuration. Now that your server is running, you can connect the antivirus and anti-spam applications. By default, AXIGEN comes with connectors for the ClamAV Antivirus and SpamAssasin Antispam application. The setup process below describes how to make these two applications work with AXIGEN. However, note that AXIGEN implements a proprietary filter scripting language that allows you to implement connectors for any third party Antivirus and Antispam applications. A. Install ClamAV (daemon), on the same machine on which AXIGEN Mail Server is installed. Follow these steps in order to configure ClamAv for use with AXIGEN and start the clamd daemon. In the "Server" context, click on the Add new filter button. This will open up and display the Active Filter list. It is empty right now, so we need to add the clamav filter to the list. In the Priority field, enter a priority between 0 and 500 (a filter with priority 0 will be applied first and the one with 500, last). Important - the domain-level filters have the priority limited to range 100-400 and the user-level filters are limited to the 200-300 range. A value of "10" should be fine, leaving you space to apply some other future filters before this one. After setting the filter priority, select the socket value from in the Filter type dropdown list and the clamav value from the Filter Name list. 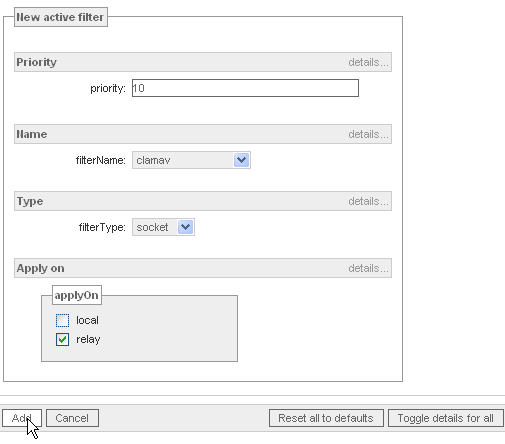 In the Apply on checklist, select the relay option, to apply the filter on outgoing mails. To make sure you scan both incoming and outgoing mails, you have to create the filter and select both values, local and relay. In AXIGEN, it is possible to enable filters either at domain or user level, in the corresponding WebAdmin tabs. The filters activated at server level will be automatically applied for all domains and accounts. However, you have the possibility to add additional filters at domain or account level. The process for Connecting SpamAssassin is similar and even less time-consuming as no configurations are necessary after the product installation. No further configurations are necessary. The connector for SpamAssassin is a socket filter for AXIGEN, so the configuration procedure is the same as for ClamAV. The difference would be that for SpamAssassin, a TCP socket is more likely to be used. At this step of the way, your mail server is ready to go, and you can also you can access the AXIGEN WebMail to send and receive test messages. Then, use the full email address and password to log on to AXIGEN WebMail, at the default address: http://127.0.0.1:8000, or use the address you specified in the initial configuration phase when you ran the setup wizard. Now you're really done: you can securely send and receive messages from your home domain and easily make any further configurations, to accommodate your specific network requirements. As you have seen, installing all mail services from one single executable and an intuitive Web configuration interface make things a lot easier and a lot less time-consuming. Maybe this is not the best place to promote a commercial product. you have a valid point about paid and opensource softwares and I personally think that if you are using even an open source software for your commercial use you should give credit to the programmer on your site or donate some money to him to encourage him. Also big companies or people who have critical applications have a tendency to choose commercial softwares due to its CONFIRMED technical support as they paid for it. For open source you are dependant on the community when you are stuck somewhere. so I will still give credit to the author to leave good resource for those who may want to use the commercial one but I will also recommend him to post the similar article based on the opensource one. hmm, bronto if you occasionally got your head out of the sand it might have helped you . Not everything revolves around you, open source and one user installations. Zimbra is a fine product - but it's geared towards slightly different audience. The problem with Zimbra is that they offer open-source solution that is useful for either really cheap company or for a small company ( or personal use). The Opensource Edition should actually be renamed as Free Truncated Version Of Our Product. Considering, that I recently did a lot of comparisons between different mail server solutions, here are a few major differences between zimbra, scalix & axigen: PRICE, support, antivirus, etc. I actually compared enterprise editions for all major mail servers out there looking for an alternative to Exchange server. I'm a big proponent of opensource ( we are a debian and ruby shop), but there is such thing as business requirements, and axigen does better in these: * there is no Premium vs Regular account( yes I'm looking at you scalix) * axigen works with AVG ( our antivirus of choice, since we already invested in it.) * zimbra is geared towards web based approach, and axigen supports web interface as a feature * unfortunately I have to deal with 50% Outlook users (out of 300 email accounts, which means I need a lot of outlook connectors, for people that are not heavy email users), some mobile users and thankfully some Thunderbird installations * axigen is cheaper once you break the threshold of about 70 users. ( zimbra ~ 2800 for 100 users, Axigen is around 1500 to 2000, depending on add-ons, scalix is even more expensive, plus axigen's & scalix licenses are perepetual, with zimbra you would have to pay per year) * has better integration with ldap. I'm not trying to say that one is better than the other, since it all depends on a particular use case. If your business requirements require a web based solution, - like you working for a company that has users all over the world, then may be zimbra is a better solution, or may be dovecot, or may be you should use Gmail for Business or something. I don't know - it depends on situation. So I guess what I'm trying to say is, that I'm tired of hearing little script kiddies blackmouth good products, when they have no idea what the hell they are talking about.